International Space Station expedition lead Sunita Williams recently steered a Lego Mindstorms robot at an ESA facility in Darmstadt while she was orbiting overhead, proving that future space explorers could directly control a vehicle on a planetary surface while staying out of harm’s way. NASA and the European Space Agency (ESA) have successfully demonstrated an ”interplanetary” communication network that one day may enable internet-like communications between space mission controllers and deep space spacecraft or robotic rovers on another planet. U.S. astronaut Sunita Williams, commander of the International Space Station’s Expedition 33 mission, used NASA’s experimental Disruption Tolerant Networking (DTN) protocol to transmit two-way messages from a laptop to an ESA educational LEGO Mindstorms robot on Earth at the German European Space Operations Center in Darmstadt. NASA’s DTN architecture is a state-of-the art communications technology designed to enable standardized communications over long distances, taking into account time delays associated with deep space spacecraft and planetary robotic systems, agency officials said. At the core of the DTN suite is something called the Bundle Protocol (BP), which allows standardized communications similar to the World Wide Web Internet Protocol (IP). The big difference between the two is that IP assumes a seamless end-to-end data path, while BP is built taking into account disconnections, errors and delays of signal — glitches that would be experienced in deep-space communications. In due course the DTN technology could eventually become the cardinal technique of communicating between planets, as well as a way to operate deep space robotic rovers from Earth, the space agency said. Work on DTN is part of NASA’s Space Communication and Navigation Program, which coordinates multiple space communications networks and provides network support to regulate, maintain and grow the agency’s space communications and navigation capabilities. 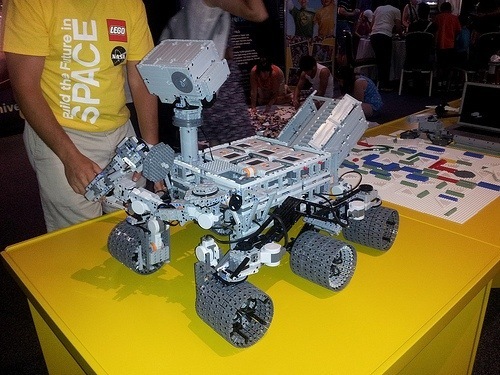 A working replica of the Curiosity Rover built with LEGO Mindstorm (Source: battlebricks.com). LEGO Mindstorms is an educational construction kit used by universities and laboratories worldwide. It provides a programmable microcomputer and an array of actuators and sensors that can be assembled with traditional LEGO components, enabling rapid development and testing of full-featured autonomous robots. The kit is very popular among space enthusiasts, who constantly push it to the limits, studying new concepts or building replicas of existing ones, such as a working replica of the Mars Curiosity rover presented at the Build the Future in Space day at NASA’s Kennedy Space Center.